Meatloaf has been a favorite dinner recipe of mine since I was a little kid. Since starting my Keto Diet Menu I haven't had meatloaf because meatloaf isn't meatloaf without ketchup or breadcrumbs, but I have officially found a low carb ketchup and a low carb meatloaf binder alternative for Panko breadcrumbs that are Keto Diet approved. This is a really easy low carb meatloaf recipe with really only three simple steps. First, in a large bowl combine the ground beef, diced onion, pork rinds, pepper, salt, Italian seasoning, garlic powder, onion powder, and egg. There’s really no better way to kneed all the ingredients together than using your hands, a spoon, whisk or spatula won’t really do the trick. Once all the ingredients are well-combined, portion the mixture into a muffin pan ( be sure you spray/grease the muffin pan). I used a 1/4 cup measuring cup to portion them out which made eleven Keto Meatloaf Muffins. Before placing them into the muffin pan kind of pack each one with your hands into a puck shape. Top each mini meatloaf with 1/2 tablespoon of Trader Joe’s organic ketchup. Once the oven is preheated to 350 F, baked the meatloaves for about 15 minutes. Breadcrumbs are usually the key to a really good meatloaf, but when making a Keto Meatloaf recipe breadcrumbs are kinda not an option lol. But don’t worry if you use Pork Panko instead to won’t miss the breadcrumbs at all plus it turns these into gluten free meatloafs! Pork Panko is seriously the perfect breadcrumb substitute for any recipe. It’s essentially pork rinds ground up really fine to the consistency of breadcrumbs. You can crush up pork rinds yourself, but it tends to be moist and won’t be as good of a low carb meatloaf binder as Pork Panko. 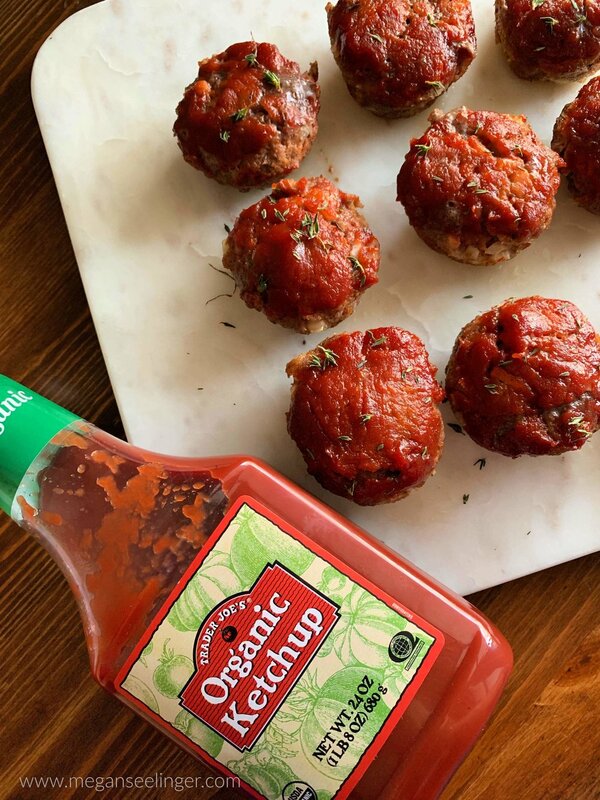 To top off these Keto Meatloaf Muffins I use Trader Joe's organic ketchup , which has no processed ingredients or long list of ingredients you can’t pronounce. Plus it only has 3 carbs per tablespoon, which is a lot less than the ketchup you find at a regular grocery store. I do want to point out that this ketchup does still have sugar list on the ingredients. I usually try to avoid sugar, but 1. I love ketchup so I’m willing to make an exception 2. I only use it in small quantities, like these meatloaf muffins which are only topped with 1/2 tablespoon 3. I’d rather is have sugar than an artificial sweetener. 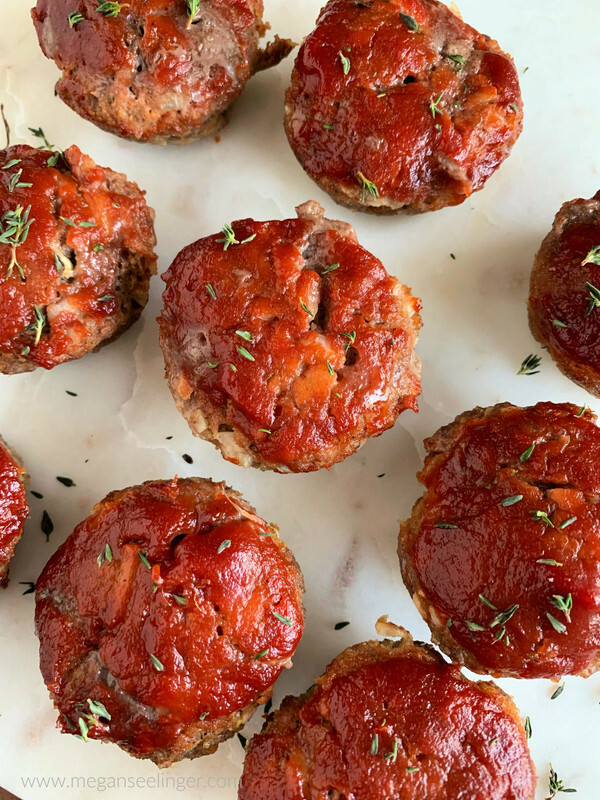 These Mini Keto Meatloaf Muffins are great for Keto meal prep lunches. I like serving my meatloafs with this Crockpot or Instant Pot Garlic Cauliflower Mash Recipe, topped with grass-fed butter and of course a Keto meatloaf! These also make for perfect Savory Fat Bomb appetizers to take to a party that way you can have a Keto friendly choice and even non-Keto-ers will have no idea they are even part of a Keto diet menu. Keep in mind if you are on a keto diet you count net carbs, so Total Carbs - Dietary Fiber = net carbs. @themermaidwithmuscles so I can see how it turned out! In a bowl combine ground beef, chopped onion, egg, pork panko, onion powder, garlic powder, Italian seasoning, salt, pepper and knead together until well combined.